AluMaxTM high temperature, heat resistant poly-layered aluminized PET coated Aramid fabric reflects radiant heat and is the perfect protection for covering equipment that is in close proximity to intense radiant sources such as super-hot metal slabs, liquid and molten metals or glass, open flame/plasma or engine exhaust manifolds. Excellent long term flexibility for use in garments, with or without liner materials. This heat reflective fabric reflects 95% or more of the radiant heat that contacts its surface. Constructed from a high-temperature base filament or texturized fiberglass fabric. 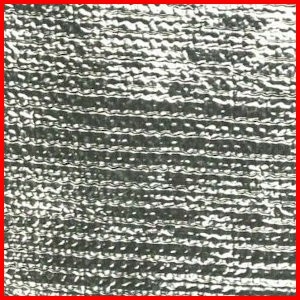 The base fabric will withstand continuous operation at 400°F / 204°C, this fabric will withstand short duration exposure up to 1115°F / 600°C and up to 3000°F / 1650°C for very short durations. . This fabric is also available with a self-adhesive backing. The adhesive is acrylic based, and will burn-off or vaporize at temperatures above 400°F. If prolonged use of the self-adhesive fabric above 400°F is desired, then alternate securing methods such as fasteners, wire or clamps should be used. Personnel should avoid inhaling fumes from the PSA.